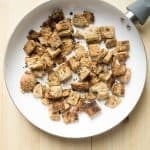 Homemade croutons come together quick and easy! All you need are 3 ingredients and a frying pan! 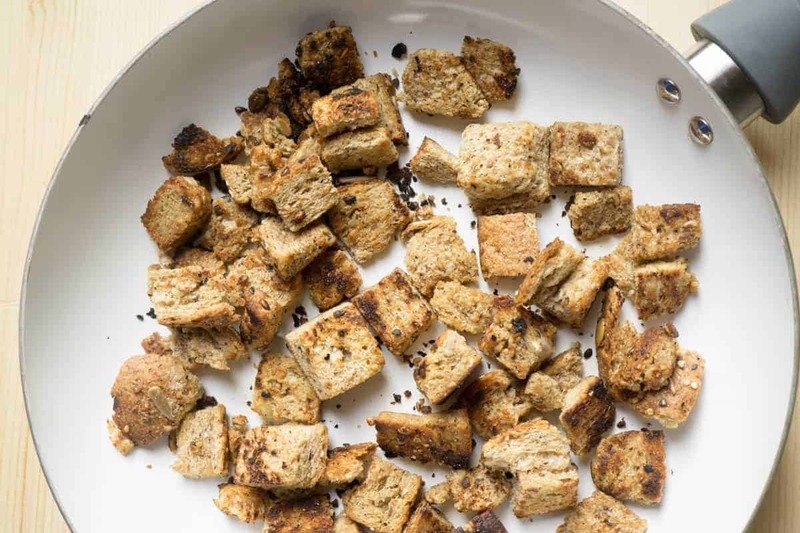 You know how you just take some things for granted as “things you buy” and other items as “things you make?” Croutons were one of those foods that had never even occurred to me to make myself. It wasn’t until I traveled to Germany on a high school exchange trip that I discovered homemade croutons! And, as most things go, they were incredibly delicious and oh-so-much better than storebought! There’s a dish in Germany called “Kartoffel Knoedel”, which is roughly translated to potato dumplings. These are made by rolling a sticky mashed potato dough into balls and stuffing with homemade croutons. You then boil the dumplings and serve with a gravy. I’m drooling just thinking about them! So yeah, you can use these croutons to make Kartoffel Knoedel or you can use them on a good old salad such as this Caesar salad with the most amazing vegetarian Caesar dressing. 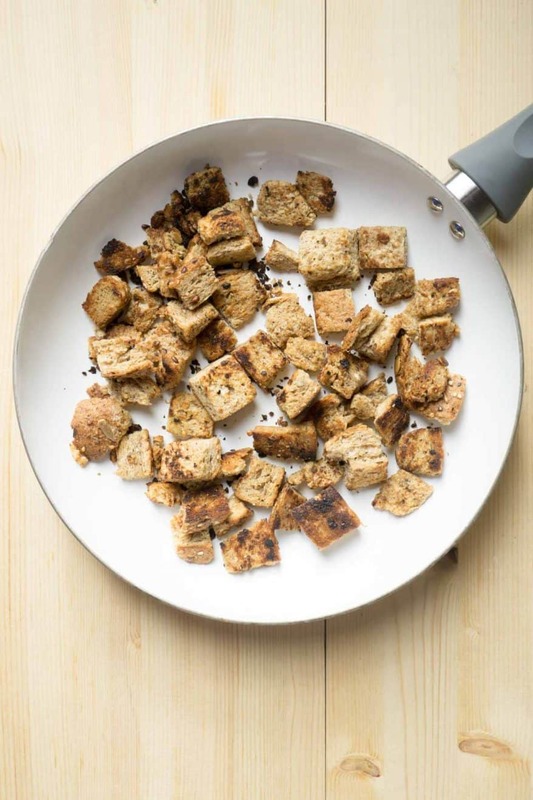 Croutons are a fantastic use for stale bread…. or even the discarded crusts of your children’s sandwiches! It’s said that 1/3 of all food produced in the US is thrown away. Day old bread doesn’t have to be one of them! I recently came across a clearout at my grocery store. Loaves of bread, which normally sell at $5-6, were on sale for $.66! I snatched up 6 loaves and stuck them in my freezer. They work perfectly for things like panini sandwiches or croutons! 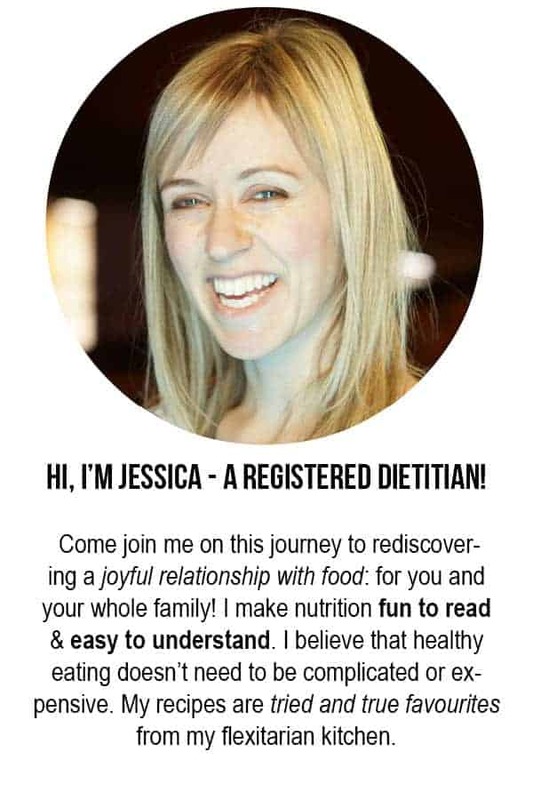 As I always say, when you make food from scratch, you get COMPLETE control over the ingredients and nutrition! Store bought croutons are almost exclusively made with white bread. I used a whole grain bread as the base for these ones, which added fibre and minerals. And if you wanted, you could cut back on the butter/oil and make these even lighter in calories. Heat the butter or olive oil over medium low heat in a medium to large sized frying pan. Add the cubed bread and stir to coat with the butter/oil. Sprinkle with garlic powder and a dash of salt. Saute, stirring occasionally until the croutons turn a golden brown on both sides. Best if served immediately. If you live in a humid place they will start to go soft pretty soon!